Inspire others to help in the fight for a cure to breast cancer by wearing this breast cancer awareness shirt! 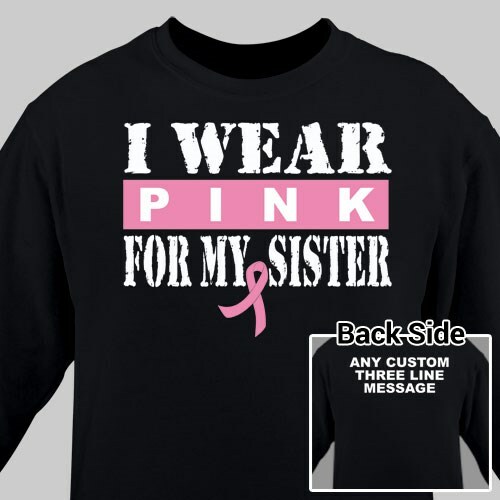 This would be a great item to wear at your next walk or fundraising event. Show the whole world who you walk for and why this cause is so close to your heart. This inspirational design is featured on our premium 100% cotton, preshrunk long sleeve shirt, machine washable in youth sizes S-L and adult sizes S-2XL. Free personalization of any title on the front and any three line custom message on the back of the shirt is included. Additional Info Show your loved ones who may be fighting the battle with breast cancer how much you care about them by "wearing pink" for them. They'll appreciate the thought when you show your support by wearing this. Our Tackle Breast Cancer T-Shirt is another great design option to consider.